According to a new Ontario survey conducted by Abacus Data, managing the economy, keeping taxes low, and government trust and ethics are cited as the top issues that would be important to influencing voters’ choice on election day. Respondents were first asked to select which issues, if any, were important to deciding their vote from a list of 12 possible issues. Respondents could select as many issues as they wanted. For those who selected a particular issue, they were then asked to select which political party was best able to deal with the issue. This exercise provides us with an understanding of not only what issues are important but also which parties are considered to be best able to deal with the issue among those who care about it. Ontarians are most concerned about the economy as eight in ten respondents (80%) selected the issue as one that would be important to deciding how they would vote. Among those 80% who said managing the economy was important to their vote, 45% believed the PC Party was best able to deal with the issue while 33% selected the Ontario Liberal Party. The NDP was well back at 19%. The level of taxation in Ontario was important to two thirds of respondents (66%). Respondents who said keeping taxes low was an important issue were most likely to believe that the PC Party was best able to deal with the issue (48%) followed by the NDP (28%) and the Liberal Party (17%). The Liberal Party performed the worst on the issue of keeping taxes low. Government Ethics and Trust was only one of two issues we tested where the NDP was considered best able to deal with the issue. Overall, 65% of respondents considered government ethics and trust to be important to deciding their vote. Of those respondents, 36% considered the NDP to be best on the issue while 34% selected the PC Party. The incumbent Liberal Party were third at 23%. Of the 60% of respondents who said reducing hospital and surgery wait times was an important issue, 37% believed the Liberal Party was best able to deal with the issue, followed by the PC Party (30%) and the NDP (29%). Similar to reducing wait times, 57% of respondents said that maintaining high quality public services was important to their vote choice. Of those respondents 42% believed the Liberal Party was best able to deal with the issue while 31% selected the NDP. 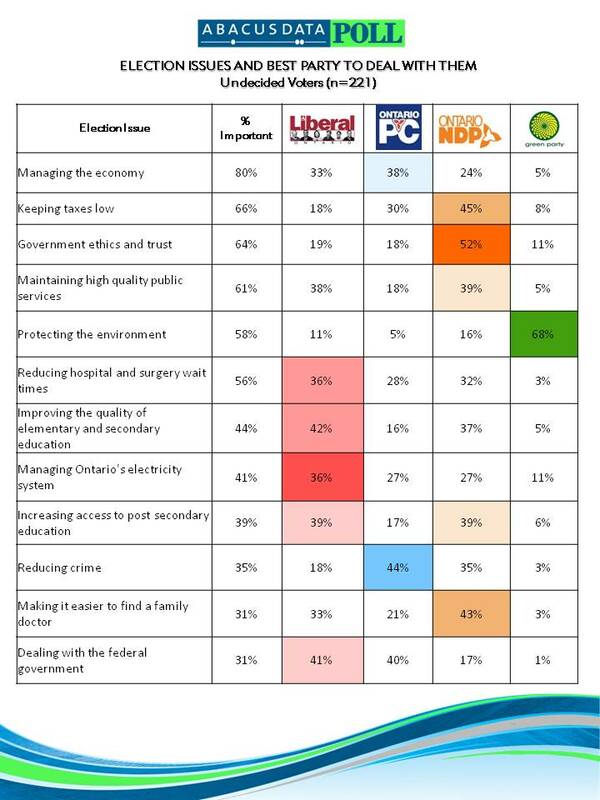 Only 24% of respondents who cared about maintaining high quality public services believed the PC Party was the best party to deal with the issue. What does this poll tell us? The Liberal Party’s strength lies in its perceived ability to maintain public services, reduce waiting times, and improve education in the province. It is weakest on issues of taxation and ethics. The PC Party does best among those who care about keeping taxes low, reducing crime, and managing the economy. In fact, the Tories do best among the two issues that voters care the most about it. This may explain why their supporters are the most committed at this point. They have a clearly defined message and their supporters recognize it. The NDP does best among those who care about ethics and trust but its major hurdle remains the fact that so few Ontarians believe it is the best party to manage the economy. The Liberals have a clear advantage on issues around health care, education, and maintaining high quality public services. They have an opportunity to focus the electorate on public services by continuing to highlight their record on education and health care in contrast to that of part PC governments. Along with taxes and trust, the Liberals still have some work to do to convince voters who care about the economy that they are its best stewards. The Tories should continue to focus their attention on taxes and the economy. Right now they have an advantage on the two issues most important to voters. However, the PC Party is vulnerable if the debate is centred around the maintenance of public services on the one hand and reducing taxes and cutting spending on the other. The NDP lacks clear issue definition (a deviation from a similar exercise Abacus did for the federal political parties during the federal election). The NDP’s strengths relate to ethics and trust and family doctors while its weakness continues to be its perceived ability to manage the economy. If the NDP is going to be able to convert what appears to be a significant pool of potential supporters, it has to press the Liberals and Tories on ethics and trust while reassuring voters that it can competently manage the economy. We classify undecideds as those respondents who told us there were not more likely to vote for one party than any other and were therefore equally as likely to vote for more than one party. As our release on Tuesday reported, the Liberal Party and NDP had the most room to grow among these voters. As such, it is no surprise that the Liberal Party and NDP do better among many of the issues that undecided voters care about. For the NDP, their strengths among undecided voters are among those who said ethics and trust, taxes, and finding a family doctor were important issues. In all three, they were the party considered best able to deal with the issues. However, even among undecided voters, only 24% of undecided voters who said managing the economy was important selected the NDP as best able to deal with it. This indicates that economic management remains an Achilles heal for the NDP even among undecided voters though the NDP’s positioning on taxes may help them to attract undecided voters who are turned off by the HST or other tax increases during the Liberal government’s term in office. For the Liberal Party, education and health care are its issue strengths among undecided voters although these issues are less frequently cited as important issues among undecided voters. The party still faces challenges on issues around taxes and ethics and trust. For the Tories, their advantage on economic management continues with undecided voters but they are vulnerable on issues around trust and ethics, public services, and education. This explains the relatively few undecided voters who told us they are likely to vote PC. Between September 9 and 12, 2011 Abacus Data Inc. conducted an online survey among 1,002 randomly selected Ontario Canadian adults from a representative online panel. The margin of error—which measures sampling variability—is comparable to +/- 3.2%, 19 times out of 20. Results of the survey were statistically weighted by gender, age, region, and education using census data from Statistics Canada and by past vote using Elections Canada results from the 2007 Ontario provincial election. Totals may not add up to 100 due to rounding.